Today’s video is about trying to find the highest level thing that you can be doing in this moment advance yourself, get yourself away from alcohol, and pull yourself towards that future that you want to achieve. 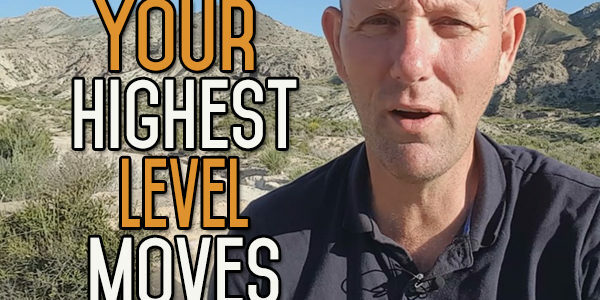 Today I want to talk about what is the highest level thing you can do right now to move yourself forward in your life. The highest level thing means what is the thing you can do in this moment that will make a difference to tomorrow, and the next day; that will bring you one step further away from alcohol and further towards the life you want to live. First of all, you have to have a goal that you want to achieve. You can have one overriding goal, this is the person you want to be. Then you’ve got a lot of different goals in different areas of your life, your relationships, career, education, hobbies, what you want to do to improve yourself culturally. You have all these little areas in your life that you have goals and you want to achieve those goals, but they’re all under this one big umbrella goal which is you being this person that you see yourself as. For me, I have a lot of goals in my life. I want to be able to do 100 press-ups at once, and I’m slowly building up to that. I’m on press-up 27 at the moment. I can do 27 at once. I try to improve that by one every few days. One of the highest level things I can do every morning is get up and go out walking. That sets my day up right, sets my mind up as well as my mood. One of the things about this whole journey, it might seem that these goals are unobtainable. They might seem so far into the distance that either you haven’t got the skills to do it, the confidence to do it, the abilities to do it, or you just think that it’s going to be so much hard work and you can’t be arsed doing it. This can put a lot of road blocks in your way. Find the things you can do right now in the moment that is going to take you one step towards the overall goal or a specific goal. You’ve got an overall goal, and you need to break them into smaller goals, and break those smaller goals into yet smaller goals. Then you come down into the basic steps you need to take. The ones that are going to be the greatest impact. There’s a thing called the 80-20 rule, which states that 80% of the things you do in your life are going to give you 20% of the results, and 20% of the things you do are going to give you 80% of the results. e doing, then you would get 80% of the results, and leave what you spend 80% on that is only giving you 20%. This is called Pareto’s law. No matter where this law has been looked t in life, it’s come true. It’s not always 80-20 sometimes it’s 70-30, sometimes it’s 90-10. So, try and focus on what is going to bring you the best result now. The more you can focus on the thing that will give you the highest level of result now, that will move you more towards the things you want to achieve, that’s what you should be doing. Sometimes it’s not obvious what you have to do. Sometimes you have to do a bit of thinking. Other times it’s dead obvious, you just have to get up and do it. What’s your position on AA and other 12 step policys? I’m certain you’ve been asked this question many times.